Please froward this to anyone you know who may be interested in being involved with this study. 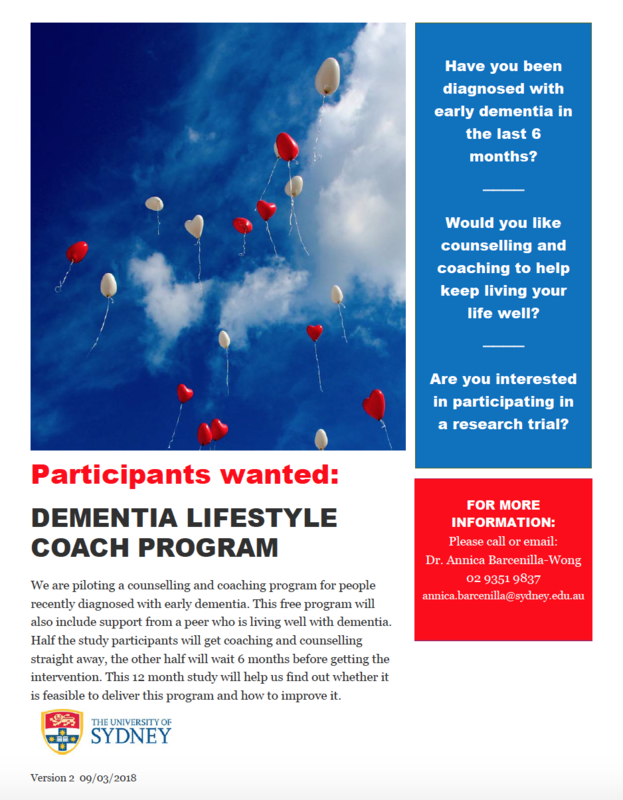 We have the coaches trained, but are still looking for participants living in Australia who have been diagnosed in the early stages of dementia (any age), within the last six months. Download the dementia-lifestyle-coaching flyer or the image below. Creating any change is difficult, but especially so when the health care sector and service providers will not make any changes, even those based on common sense, without research studies. This is one research study that we hope will start the much needed change to what happens to people at the time of diagnosis. Hopefully it will help to stop the Prescribed Disengagement®, and support people to live more positively, and break down the stigma and discrimination experienced following a diagnosis of dementia. August 11, 2018 in Daily Blog, Dementia, Living beyond dementia™, Prescribed Disengagement ®, Stigma. ← Is sharing a diagnosis of dementia brave? Can people from UK get involved in this study? Hi Kate, Is the study for people under 65 years then locally it is being called” younger onset”-while overseas it is called” early”. I have members of support group who are over 65 but have just been diagnosed with early stages of dementia. Keep up the good work. Haha, new job. It is a research project, and not one I get paid to be a resercher in. But at least participnts are being funded for their time, so it is progress. Universities are used to reserchers being on salary, which I’m not. Bummer I was excited that so progress had been made in that field. Fingers crossed that you will be able to share your vast knowledge and experience for positive change pissed you are not being paid for it.